Today was my kind of weather! It's was a much needed warm day to boost my spirits! You know what?? The kids needed it too. They were thrilled when they got so hot they had to shed their jackets and jeans. Us Texas people...we needed this day! We celebrated by getting slurpees! 72 degrees!! WhoooHoo! 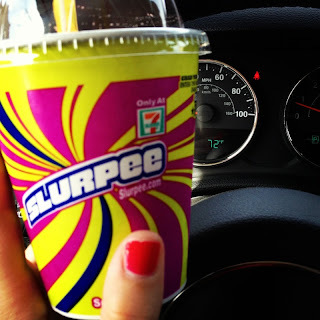 Slurpees are a family favorite from back home. The kids were loving a cool drink on this amazing spring day!